NEW YORK (CBS) Police in Norfolk, Neb. 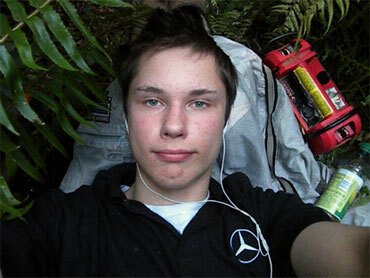 have issued a warrant for the arrest of Colton Harris-Moore, better known as the "Barefoot Bandit." Police in the young man's home state of Washington made a positive identification of the 19-year-old from an infra-red videotape supplied to them by police in Norfolk. Detective Ed Wallace of the Island County Sheriff's office on Whidbey Island, Wa. told a producer from 48 Hours | Mystery that his department had examined the videotape and, despite the poor quality of the video, confirmed that the person seen rifling through a desk in the rental car office of a small airport in Norfolk about a week ago is the infamous youth. The video was taken at the Karl Stefan Memorial Airport. The so-called "Barefoot Bandit," the most wanted teenager in America, allegedly broke into the office, used a computer, and stole some cash. A 2008 Escalade was later stolen, one of a series of car thefts authorities now believe is the work of Harris-Moore. The trail went cold last week when police in Dallas City, Ill. found a stolen 2010 Chevrolet abandoned in a creek bed. Police in Washington State have been pursuing Harris-Moore for more than two years, since the youth escaped from a halfway house in Renton, Wash. In the intervening time, Harris-Moore has allegedly stolen cars, trucks, boats and four airplanes. The string of thefts has turned him into something of a folk hero on the internet. He has tens of thousands of fans on Facebook, T-shirts with his image are being sold, and songs have been written. Part of Harris-Moore's appeal is that he had never even been inside a plane until he allegedly stole and flew his first one back in November 2008. He has allegedly crash-landed planes twice, but made successful landings two other times. He apparently learned how to fly by watching a DVD and playing video games. Wallace said that although Harris-Moore has now been positively identified the police in Washington are still looking out for him. "He always comes back," Wallace said.